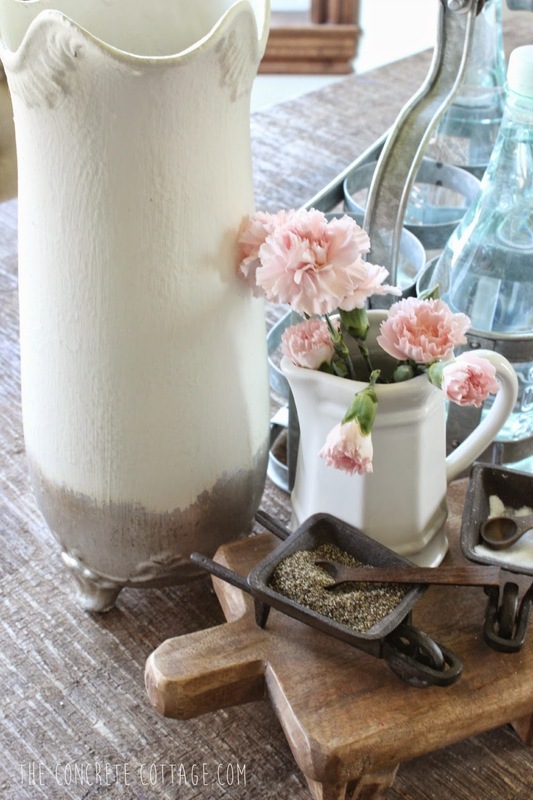 You know those beautiful old metal jugs that are so popular right now? Maybe they aren't as popular as I think, and it's like buying a new car and all the sudden you see that car everywhere. 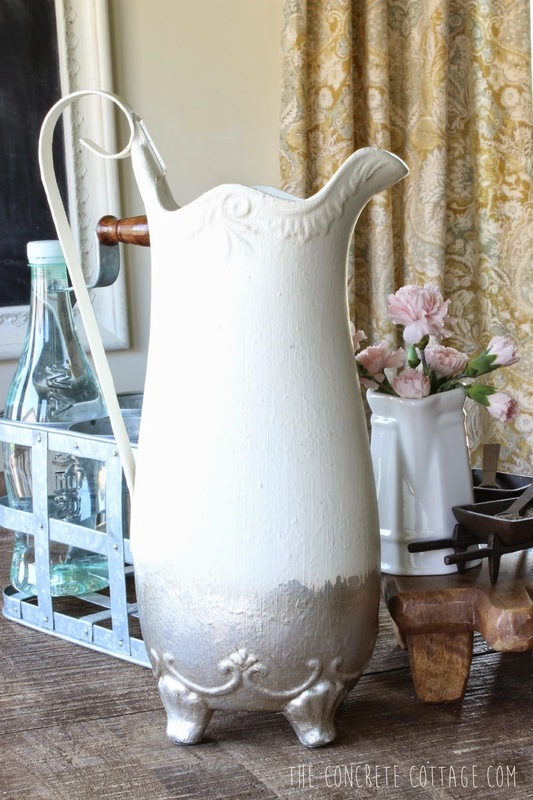 So maybe it's just that I've been wanting an old metal jug so I think I see them all over the internet. Or, maybe they're just all over the internet. Anyway, I've been looking for one. And guess where I found one? My jug-in-a-box didn't exactly have the look I wanted, so I did what I always do and painted it. 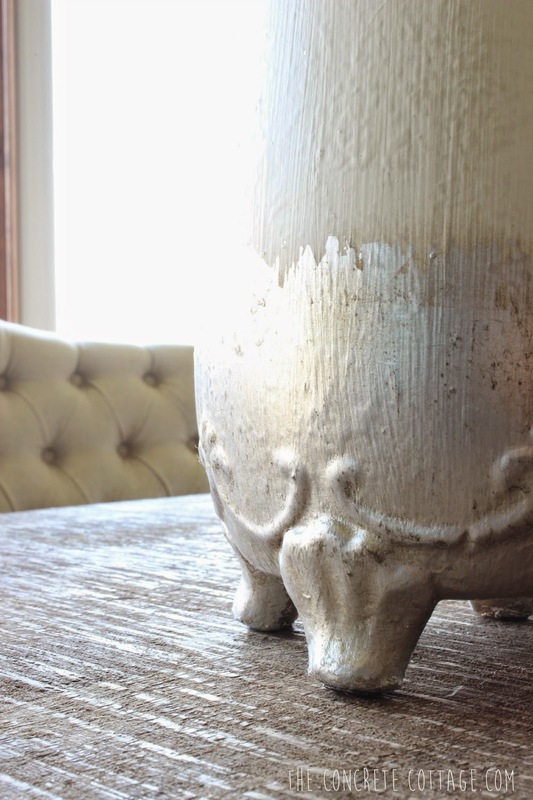 Somewhere, in all the pics floating around the internet, I saw a photo of an old jug with a layer of rust on the bottom (I have no idea where I saw it, or I'd provide a link). I really liked the look, so I set about creating my own version. Minus the actual rust. I started with a good coat of ASCP in Old White. To give the bottom the "rusty feel" I liked, I used silver leafing. I don't have pics of the process, cuz I've been a very bad blogger lately, but the steps are simple. Paint on the Metal Leaf Adhesive (can be found at any craft store) to any spot you want the metal leafing to adhere. Let it dry (it'll feel tacky), then apply the Silver Leafing Sheets. The silver leaf by itself was way too bright and perfect. 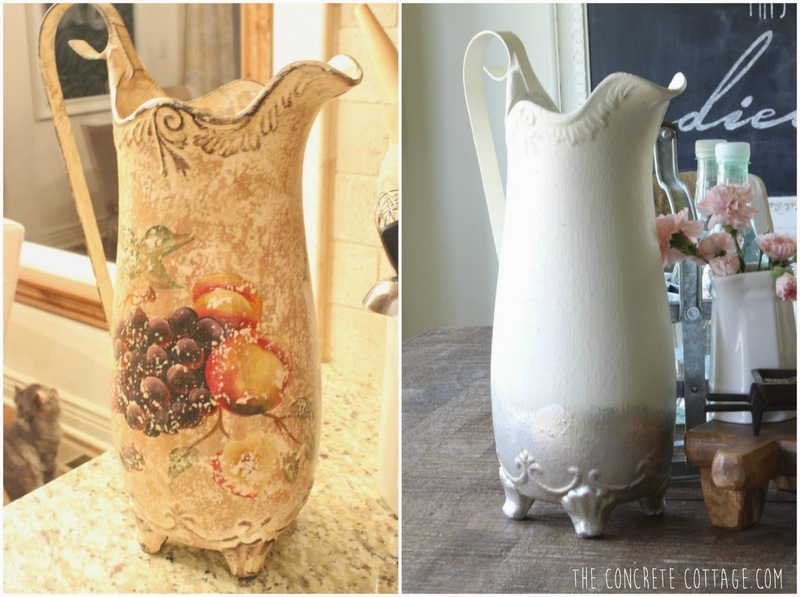 To fix that, I added a coat of Clear Annie Sloan Wax over the entire surface of the jug to seal it. Then added a few coats of the Dark AS Wax to the silver leaf. This added a lovely aged patina look I was after. I think the lesson here is... hoarding old junk in the basement for 4 years isn't as awful as Mr. Concrete thinks it is cuz some days you find old treasures you didn't remember you had. It's probably time for a garage sale. These are some of the fun blogs I link up to on a regular basis. Do yourself a favor and check them out... you won't be disappointed! Love it when I find something I forgot I had! And yes, I have stuff stashed all over the house. I actually have one of the tin pitchers you're talking about. I keep hydrangeas in it. Your version is lovely! The transformation is just what that jug needed. It looks much better. I love it! 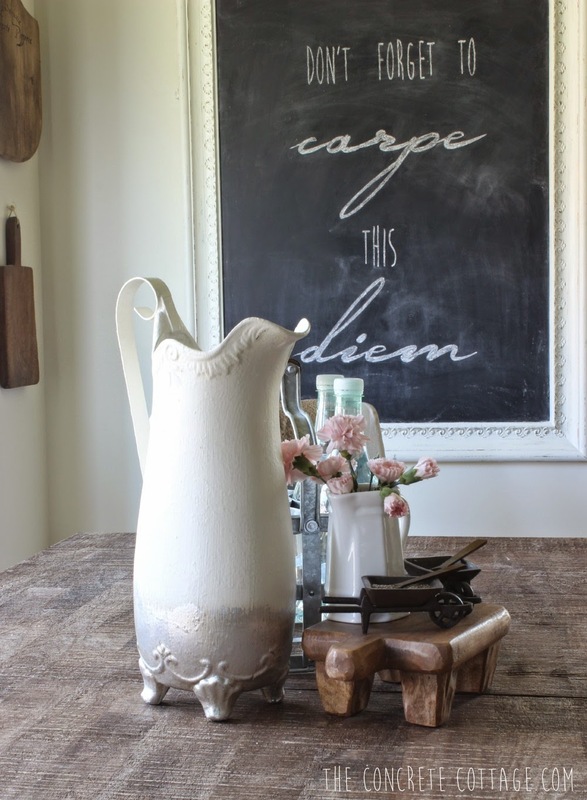 love that jug. never seen that type of piece so I guess I'm out of touch. What a delightful blog you have! 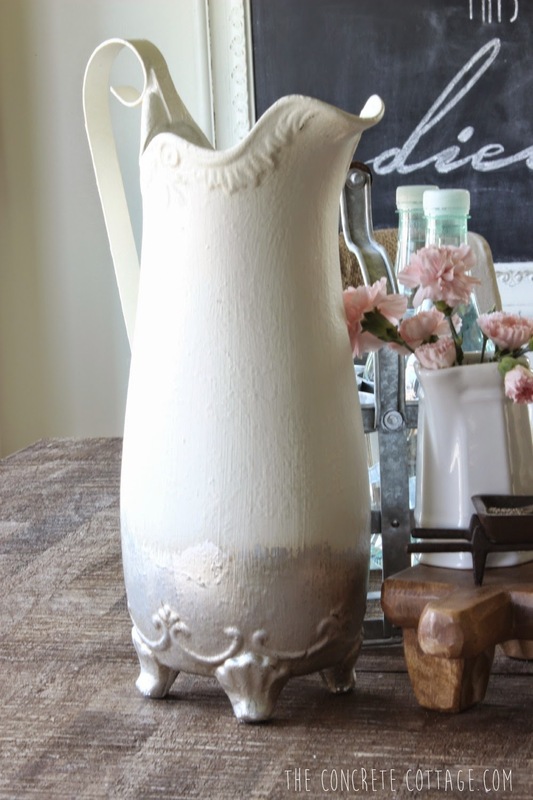 And I love this fun metal jug-well painted! Just pinned to the Fridays Unfolded links board and thanks for sharing at the party! That's really pretty. I like the addition of silver. Love your blog! 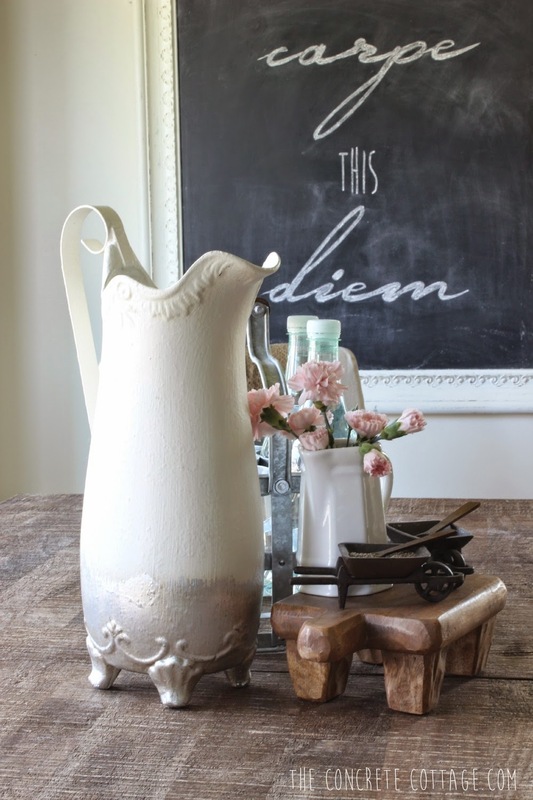 Would love for you to share this creative painted metal jug this week at Simple & Sweet Fridays.